2017 has already surpassed the average number of Special Elections for an "off year" and, in this political environment, 2018 may also prove to be a record year for resignations or early retirements. A first glance at the results of this year's seven federal (US House or Senate) special elections shows more wins in the GOP column, with Republicans holding onto all five of their Congressional seats in Kansas (4th CD), Montana (At-Large), Georgia (6th CD), South Carolina (5th CD) and Utah (3rd CD), and Democrats holding onto their one Congressional in California 34, and flipping the only US Senate election (Alabama!) to their control. But a closer look at the voter performance of those races, where the Democratic voting margin has been 16% higher than the average partisan lean in each seat, and 12% overall in both federal and state legislative special elections, provides a positive outlook for Democratic victories in 2018. 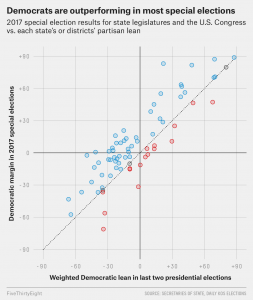 The "partisan lean" refers to the the way a district has voted in the past election cycles - and its traditional performance in favor of one party or the other. The political analysis site FiveThirtyEight took a look at the 70+ 2017 special elections for state and federal legislative seats and compared the results to the past political party voting performance of each district. The results point to a positive pattern for Dems who, regardless of the outcome of the election, are outperforming their GOP counterparts in 74% of those races. Traditionally special elections are an indication of what can be expected in the mid-term elections and, combined with President Trump's historically low approval rating (at a mere 37.1%), Republicans may be facing huge losses next November. Much can happen in one year but, for now, Democrats are looking at Happy Holidays! and help with a Contribution Here Today! Tuesday night, President Trump announced “the winner” of his nomination choice to the United States Supreme Court as Neil Gorsuch of the 10th Circuit Court of Appeals in Colorado.